This top and these skinnies are two recent purchases that I knew would pair perfectly with each other. I bought the top when I met Gina (sigh) and the skinnies were an online purchase I shared on IG here. I actually have two other pairs of similar colored pants. Why did I buy a third pair then? Well, I wear them like nobody's business. Don't believe me? Let's dig into my OOTD archives, shall we? I'm telling you. 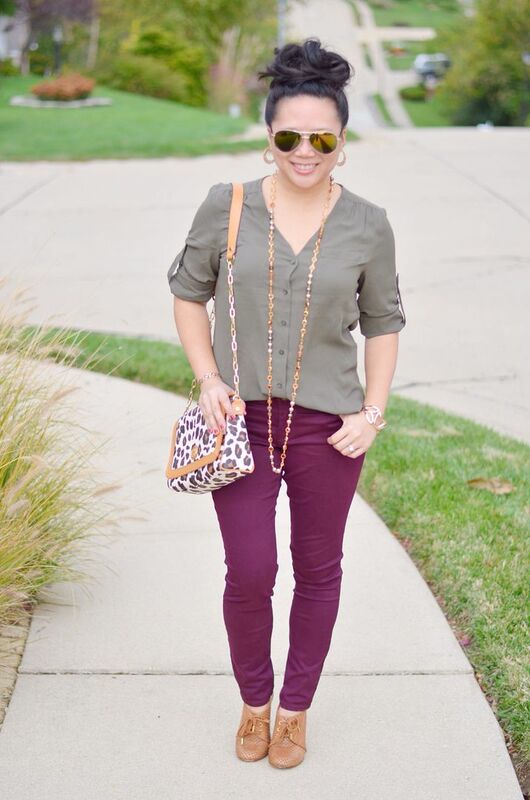 These pants are a staple - and just like having more than one pair of black leggings or more than one pair of jeans, I can truly justify having more than one pair of wine colored skinnies. Looking at all of these photos next to each other, you can see each of them are a slightly different hue. One is more cranberry, one is more plum, and this new pair is somewhere in between. I like to think of it as very similar to owning several pairs of burgundy nail polish. Just for my legs instead. :) I hope I've made my case for these - please proceed to the checkout lane with your pair now. I came home to such a pleasant surprise last week - these shoes! You see, my very good friend Val (you met her here) has these same wedges but in navy. I've always coveted them. I just love the funky preppiness about them. Apparently she came across these on eBay and won them for me as an early Christmas present. She went ahead and mailed them to me now so I had plenty of time to enjoy them now that bootie season is in full effect. Such a thoughtful gift - made my week! And I know you're starting not to believe me when I say I'm not a big Tory Burch fan…especially when I'm carrying my TB bag with this outfit. If these wedges were clad with the logo, then no, I probably would not even give them a second look, but as is, they're beautiful regardless of the label. I would like this whole outfit in my closet, please and thank you. Love the olive and wine together. The leopard is the perfect addition of print, and those shoes are just fab! I can't believe all the wear you have gotten out of colored jeans. What a pro! Ha! I wouldn't say I am a pro - but I will take the compliment - thank you! I just love them so much. They really pair well with so many things! I have skinnies in that same color. loved how u styled it. 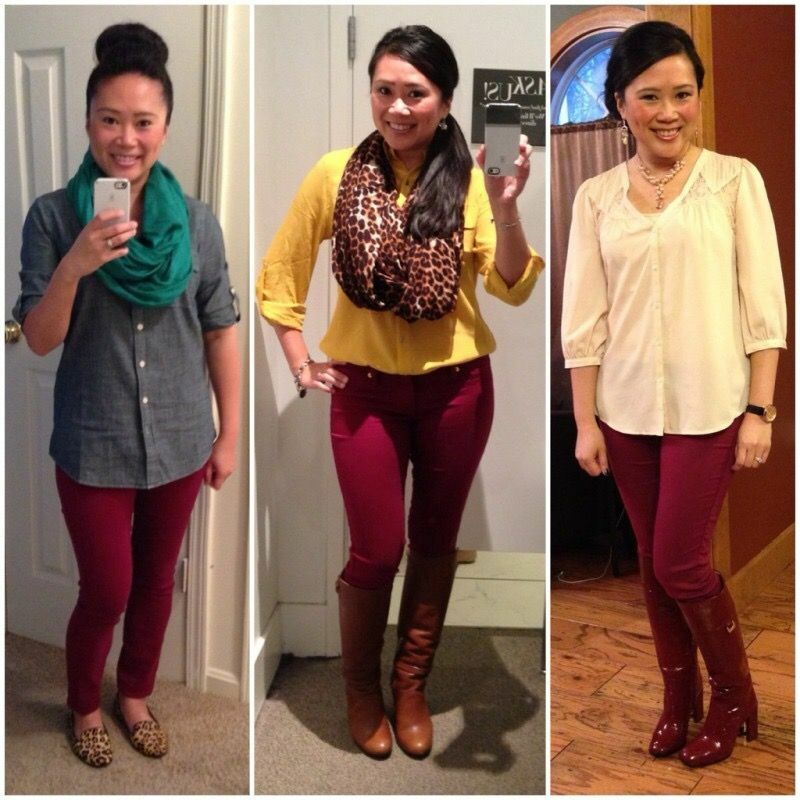 your friend is awesome love those booties and these red skinnies are really awesome staples. Love the wine paired with the taupe! and your little top knot is so perfect! You look great! Thanks, Becky! I just love that these pants go with everything! You will love them! I can't wait to see you style them!! Such a great look and you totally made me feel so much better because I just purchased a fab pair of booties in the color of your pants and I was so afraid that I wasn't going to get much use out of them.... until now! I will be referring back to this post when styling my new shoes. I love your booties and it was such a thoughtful gift from your friend! Those are hot girl! Thanks for the inspiration! 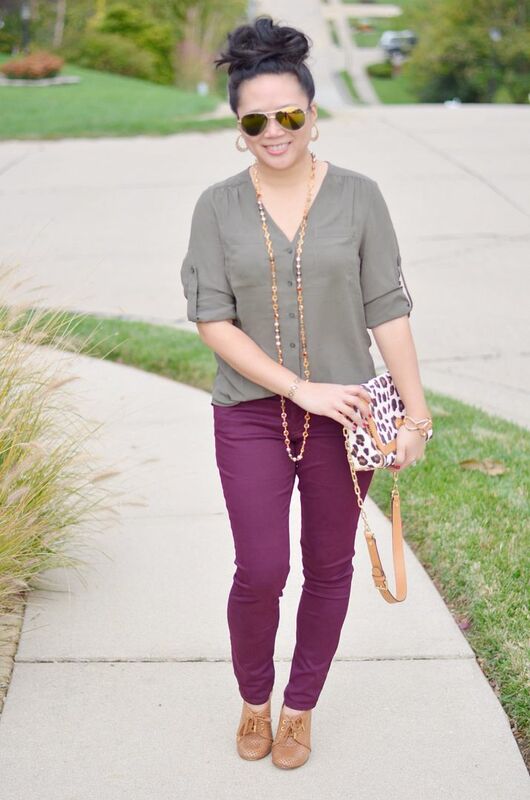 Oh I love my wine colored booties too! And you reminded me I need to wear them! The color really goes great with just about everything. Hard to think of something it does not go with. Wow! 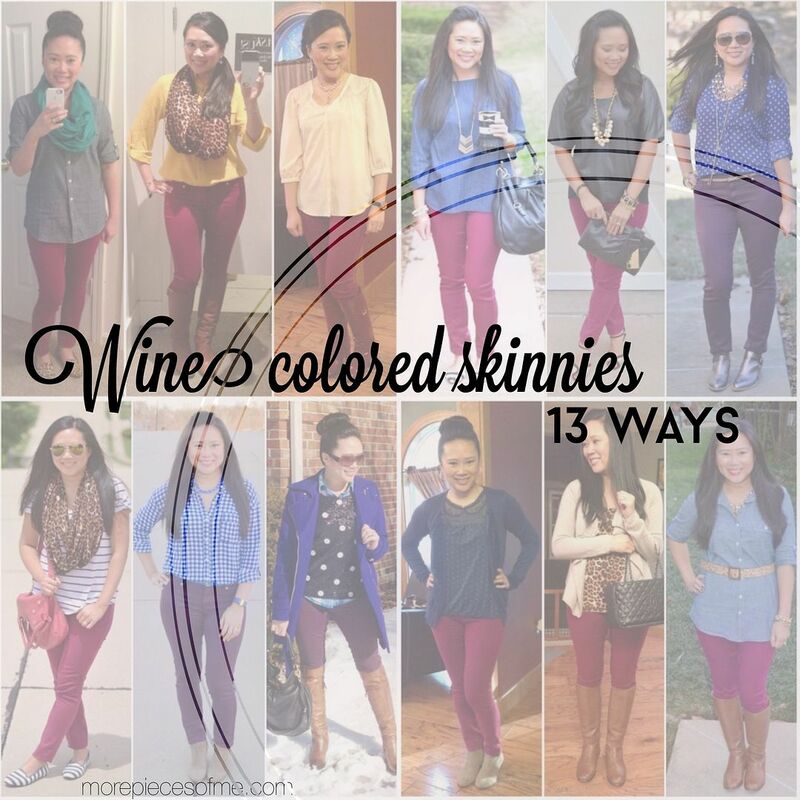 You aren't kidding around when it comes to wine skinnies! I remember several of these looks but definitely not all of them. And today's outfit is probably one of my favorites! I'm so glad you got that top! It's a great color on you and I'm sure it will pair well with like a dozen other things in your wardrobe. 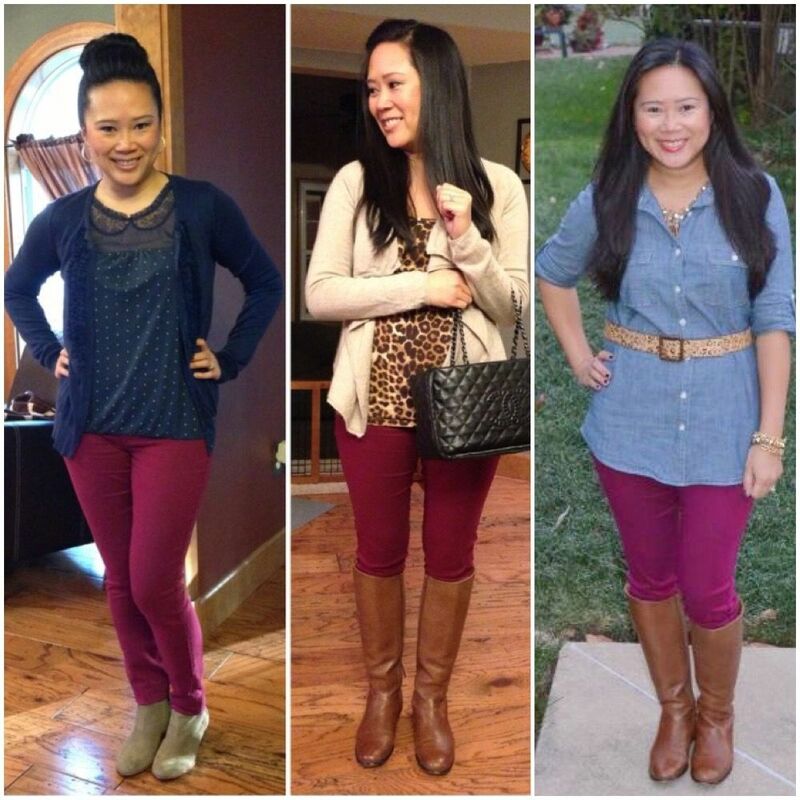 gimme, gimme, gimme, those wine colored skinnies! Ha! Yeah they are my favorite. After I finished this post i remembered two more that I didn't include here. Seriously wear them to death as they go with so many colors! Love the pairing and colors here. I'm also digging the necklace as ell. The shoes are so cute as always!! Thanks, lady! I always forget about this necklace, but it provides the perfect amount of oomph when I want something "bigger" than just a typical necklace. Those pants are amazing! LOVE the color!! Thank you! I just love them! I need those pants in my life (actually I'd steal the plum colored ones from you without remorse) they are gorgeous, I need to stop by Express, I have never tried their jeans (heresy if you ask Gina) but with these amazing colors are worth a try. These are definitely worth the try. One of the reasons I've never been able to quit Express after all these years is because their pants always fit me really great. I was glad they brought these colored skinnies back for the season! I love the color of these pants! It's one of my favorite colors to wear! I can totally see why - very easy to pair things with them! I know, right?! I guess never say never! I love these skinnies on you! I have a pair as well and adore them. :) Amazing styling with all these looks! 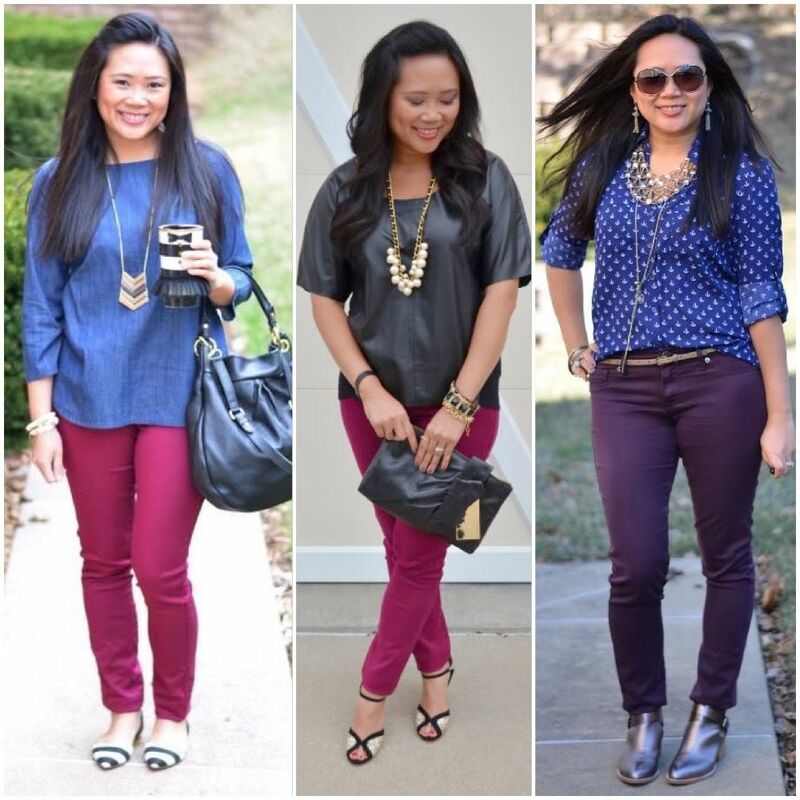 Love all the ways you've worn your skinnies! What a sweet friend you have - these TB wedges are stunning! P.S. Hope to see you join TBT Fashion link up. Yes - she is great. I was very surprised and touched at the gesture! 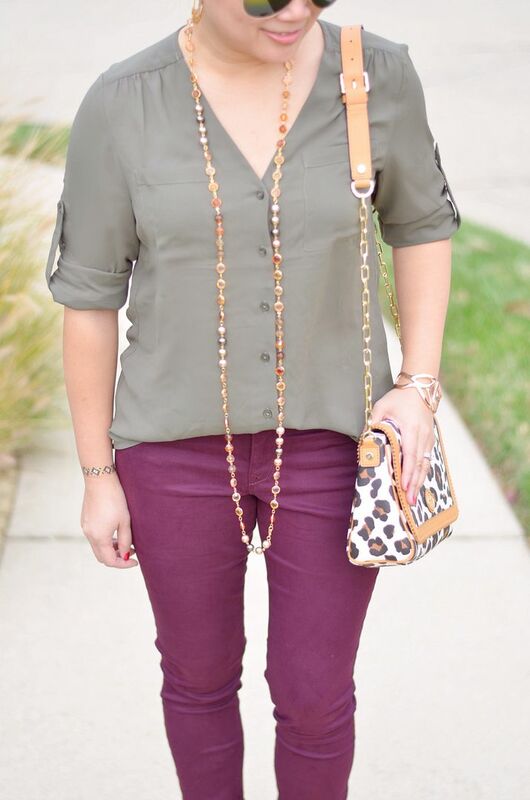 these pants are a gorgeous color and I love all the ways you've styled them! I too own 2 pairs of pants one are more purple like yours and the other more burgundy like your other pair. I have worn them several ways already but thanks for showing me more ways to wear them. 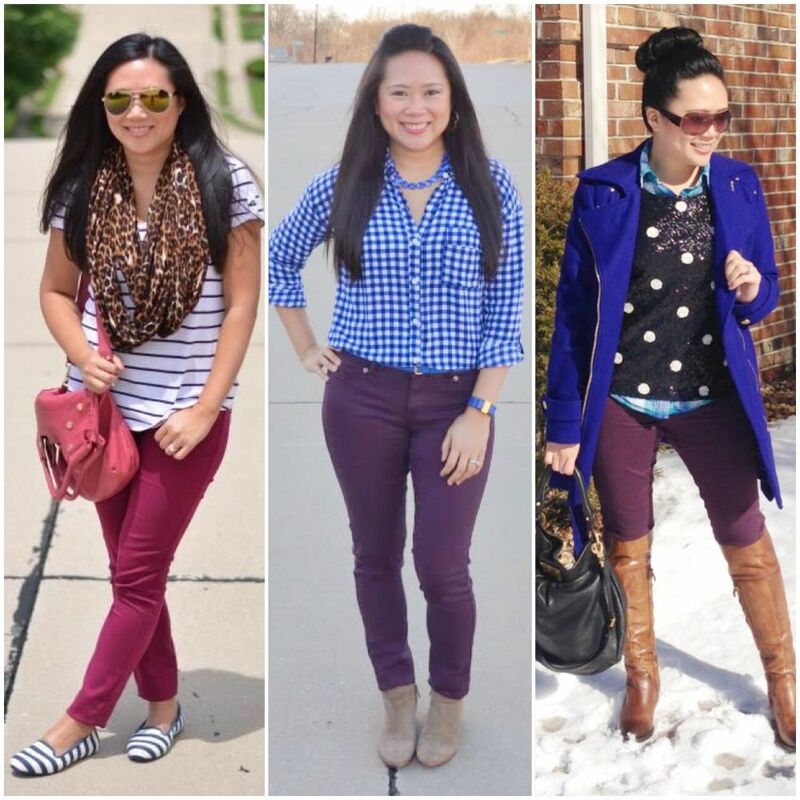 I believe that burgundy pants are a lot more versatile than one may think. Yep - it's hard for me to think of what they would not go with! I love them so much, glad you can relate! Girl, you are definitely an inspiration on mixing colors. I have the exact same color jeggings and have the most trouble finding things to wear with it. Love this combination. Thank you for linking up with the Thrift Sisters. Aww - thanks so much! Glad you enjoyed this!